Preheat the oven to 350º F. Melt the chocolate chips and the cola on low in a double boiler or carefully in a saucepan, stirring as it melts. Let cool. Meanwhile, sift together flour, both sugars, cocoa, baking soda, and salt. Mix together the eggs and buttermilk, and add the oil and the vanilla extract. Whip it together until smooth with a mixer. Add the cola mix to this mix while running the mixer. Add the flour mix gradually while mixing. 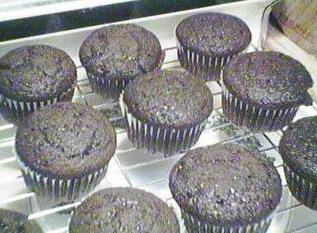 Bake in cupcake tins for 15-20 minutes. Cool in pan 10 minutes, then transfer to rack for cooling. Source: Clare Crespo Hey There, Cupcake!